So I'm trying to use NDI more as I'm getting a lot more requests to do remote integrations of conferences and there is a new service I'm looking at adding for people. I'm finding that while I initially had issues with NDI connecting (Needed to install the Skype preview build on Windows to get it to work with Wirecast 12: https://go.skype.com/windows.preview.download) that it works great for quality but the buffer delay that I am getting is absolutely unacceptable. The longer it is connected the longer it seems to be. I've attached a video example of the setup along with a followup showcasing OBS' abilities to be, get this, faster than newtek's own monitor application! While I get this is your beta, I hope this is something you can see about addressing for the live launch. Please test in Wirecast 11.1.2. Please compare Wirecast to NDI Monitor, not just OBS. CraigS I will test in 11.1.2 tomorrow when I'm in the office but in the video (both) you'll note that I am comparing them to NDI Monitor... Also... Why are you working today? Isn't it an American holiday to match our Canadian "Family Day"? Geez! I can also attest to the latency (buffer) that Mathew demonstrated in the video. We have over 50 wirecast licenses. 8 of them are used in our studio for 8 independent webcasting stations. I started to upgrade to wirecast 12 today. During testing on the first station I noticed the Audio was well out of sync with the NDI feeds coming in. This was not always the case but got worse over time. The same station setup was used yesterday with no issues. So the only change was going from 11.1.2 to wirecast 12.1 . When I found this post I uninstalled wirecast 12.1 and went back to 11.1.2 and now there is no latency again. Please get this fixed as soon as possible and if I need to create a video I can do so but I think Mathew did a great job. And it should only take a few seconds to see the issue. James Newman Use your support ticket case number and ask for a status update. I don't have a support ticket number for this issue. I literally just installed wirecast two hours ago. Found the issue, found this post and replied. I was wanting to get an update on the issue before I submitted a support ticket, because if you told me it is already addressed and going to be in the next release I wouldn't waste my time with a support ticket. James Newman This is beta discussion so there may not be logged reports as developers check directly. Please post in the public forum and also fill out our support form and get a case number. I guess since none of the beta discussions got resolutions or follow-up solutions, I'll too submit a ticket for this and reference the same videos... It's sad to see that a beta testing period didn't end with any of the bugs the testers found being corrected... again. Why is it you release new beta versions to the public if you're not going to be addressing issues? I ask out of curiosity as the last couple of times, those who were trying to help build a better product seem to have been left in the dark for some fairly major continued issues. Matthew Potter And post in the public forum so other users can jump in as well. The more input from more people the better. Issues get prioritized for various reasons. Developers discuss all these. CraigS I received a message back from Kitty already on this one. Apparently the engineers are aware of the issue already... Perhaps they should be using the "known issues" section of the release to ensure that we don't waste time on things like this? It does exist and there are sections already. Many of us do check that prior to submitting issues. "NDI latency is larger than previous builds [due to X], expect an additional 300ms to 500ms" addition. Known workarounds are X"
This one wasn't listed though. CraigS That's my point exactly. You have a section of the release notes for it and this was not mentioned. The engineers need to realize that NDI is not only the future, but is the go to technology right now for reliable ways to get Video feeds and other feeds moved around a network and into wirecast. My company as well as countless others I am sure are building their entire work flows around NDI technology. Releasing a build where NDI has not been fully tested and working is not acceptable in my opinion. Especially if the engineers knew of the issue. They certainly realize that. NDI itself is evolving and not issue free. It's always possible some scenarios are missed in testing. It's always possible that some issues are not present in some scenarios but are in others. Some issues are fixed but then broken again while fixing another issue. James Newman While I don't work there, I have worked with Chorus Media (Canadian TV network conglomerate) has switched over to NDI throughout their multi-floor building. CBC is also well on its way on converting it's studios over to it as a (currently backup but with an intent of a roll-over) manner to do the same. My initial testing with NDI was lack-luster to say the least however over the last couple of months I have been finding it more and more advantageous. At the moment, Skype (preview build) and OBS have the best builds of using it for streaming that I've seen. I have heard it works great with Tricaster and WC 11 does have a good implementation in it but it does have connectivity issues. I had hoped for 12 to improve that, which it had indeed but with this new delay I have since rolled back as I would rather put up with a minor issue during setup time trying to get it to connect than have a near half-second video delay. I hate to call you (CraigS) out on this but "It's always possible some scenarios are missed in testing" is not valid when it is literally the functionality of the video source. The only way I could see it being missed is if your developers confirmed that video was coming in and stopped there. "Is video showing up? Yea? done." I agree NDI in general has come a long way since they first released it. What integraters such as Telestream and OBS have to realize is that NDI is a constantly evolving thing. NewTek is moving at an incredible pace because they are changing the entire dynamic of single flow to an IP based workflow. As more and more people start to adopt NDI work flows, issues in wirecast revolving around NDI are going to effect more and more users. NDI for example replaces the need for Desktop Presenter and its more power full because you can have multiple monitors hooked up to a system and through NDI Scan Converter you can have all of them as a source right over the network. Desktop Presenter is limited to one. As NDI becomes more and more stable if I was telestream I would be looking at removing Desktop Presenter from the software, which saves them on development time. It also complicates the software. As you mentioned major networks are starting to change over to an NDI based work flow. Networks like that are not going to accept any issues with the technology and they are going to put pressure on Newtech to make it perfect. Wirecast just got updated to NDI 3.8. Well in a couple weeks they are announcing NDI 4. 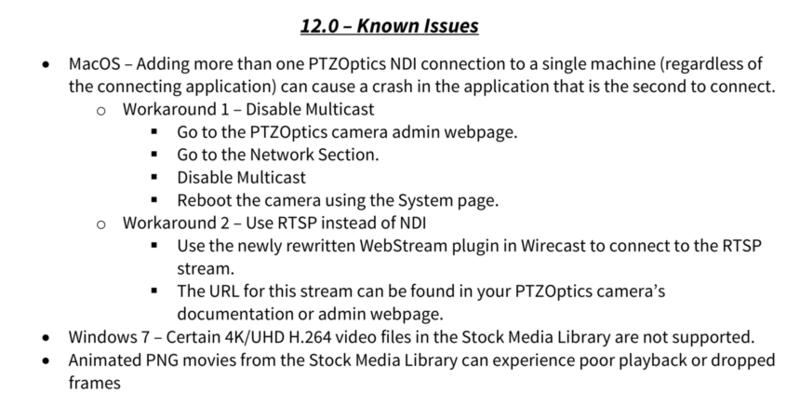 Hopefully wirecast understands just how important NDI technology is and that if they do not keep the integration with NDI and Wirecast working correctly people will look for alternative products. As NDI becomes more and more stable if I was telestream I would be looking at removing Desktop Presenter from the software, which saves them on development time. We haven't done any development with Desktop Presenter in a long time because NDI is certainly the more viable replacement. We still include support for it and built-in Screen Capture as there are still many users who many Wirecast users who haven't yet installed NDI tools. When the issue of screen capture comes, especially on external computers, I generally recommend NDI Scan Converter. Matthew Potter There's an issue that may be specific to Skype (not other NDI sources) so such other sources may not exhibit the issue. CraigS Interesting. I can test tomorrow for other sources than Skype. If it were just Skype, then it would be something to take note of and be easily testable. Perhaps you could have some of the beta members or some form of 'insiders' group to help with testing that feature and work out bugs by providing feedback for the engineers to gain insight on solutions prior to them releasing the next version.